A practical demonstration of how achievable and sustainable bioenergy can be has been implemented in the small western Victorian town of Beaufort. In February this year the district hospital bypassed its existing LPG gas boiler with a wood chip boiler plumbed into the existing hydronic heating system. Its biomass feedstock comes from a local saw mill. This outcome has been important for wood residue energy generation because it has provided a blue print for the methodology to be used by other institutions and organisations. Despite the practice of using timber waste products for heating, cooling and electricity generation for institutions like hospitals, aged care facilities and schools being common in Europe and the US it has been close to non-existant in Australia until now. A recent seminar organised by the Pyrenees Shire bioenergy project manager Daryl Scherger to demonstrate the Beaufort hospital’s wood chip plant drew wide interest from regional organisations doing their own research into more cost effective and environmentally sustainable options for heating. 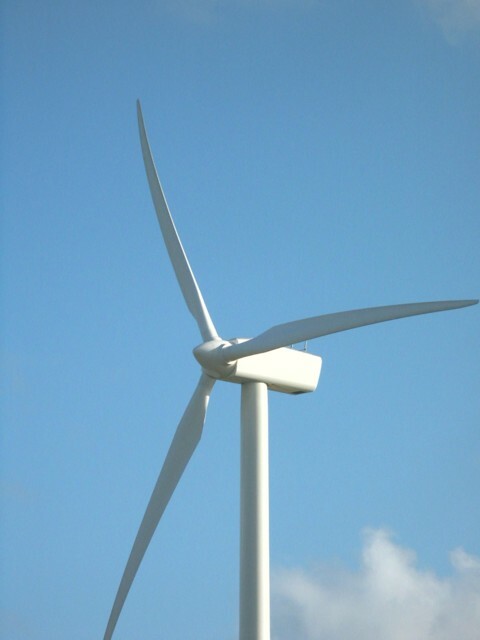 The pressure for changing fuel sources to renewable is coming from a range of directions. These include higher cost of traditional fuels such electricity, diesel and LPG compared to wood waste; community pressure to use renewable, local waste products particularly wood chips from mills and thinings from farm forestry; the connection between local renewable energy sources and local job creation; and the desire to reduce business or shire greenhouse gas emissions. According to Scherger the Beaufort hospital initiative was not undertaken on a commercial basis but needed state government funding as the knowledge and technology for wood chip boiler installation was not readily available. The idea behind the funding was that once one biomass boiler was developed, it would raise awareness of the energy source and be copied without the pioneering expenses incurred at Beaufort. The bioenergy system at the hospital is a 110kW Hargassner boiler housed in a 12 metre shipping container which includes a fuel store and filling system. The biomass boiler takes over most of the hospital heating load with the existing LPG system only operating as a back-up for boiler maintenance. The bioenergy system at the hospital is a 110kW Hargassner boiler housed in a 12 metre shipping container which includes a fuel store and filling system. While the installed cost of the boiler was expensive at $438,937 Scherger contends other organisations installing a similar plant could do so for considerably lower amount. He says the biomass boiler is estimated to deliver a financial benefit of approximately $36,000 per year through reduced energy cost for the hospital with a payback period of 12 years. If the capacity of the system exceeds expectation it is possible the hydronic heating system could be plumbed into the retirement village on the same site. Rob Mallinson, managing director of New Zealand company Living Energy supplied and installed the boiler for the hospital. 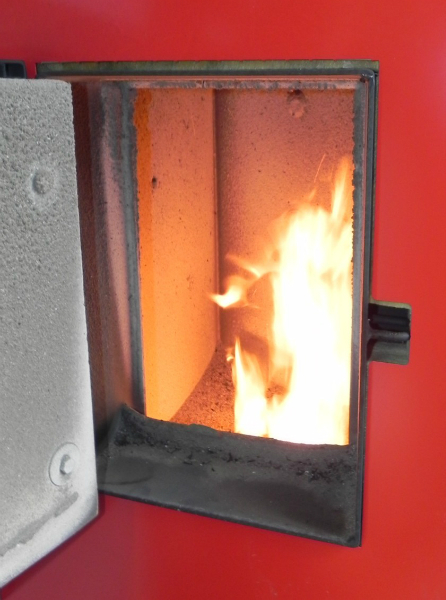 Speaking at the seminar he said modern wood chip boilers provide all the practical convenience of other systems such as automated ignition, automated fuel feed and automated boiler tube cleaning. And they provide a greenhouse gas neutral feedstock when wood chips are sourced from plantation timber processing. 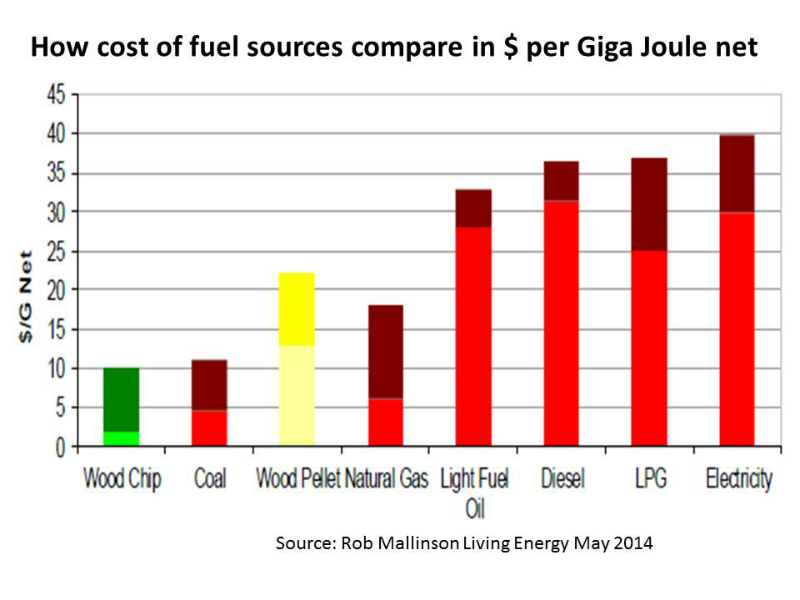 Mallinson said when comparing cost of feedstock wood chip boilers are now more competitive per giga joule of energy than most other fuels, figure 1. When natural gas is available it is generally more competitive because of the lower cost infrastructure, but as many country towns are not on the natural gas pipeline grid that is not an option. Figure 1: How energy feedstocks compare in terms of dollars per giga joule generated. Required relatively even year round heat loads. “Schools, universities, hospitals (age care facilities), pools are at the heart of the community, so are good exemplar sites,” he said. The other key component of biomass heating is wood chip supply in terms of quantity and quality. In this example Beaufort Hospital entered into an agreement with Pyrenees Timber a small sawmill just 10 km from town. It processes around 3,500 cubic metres of timber, mostly hardwood each year and has a small drying kiln for sawn timber. Around 1000 cubic metres of wood chips are produced per year and were previously sold into the garden landscaping market. In its agreement with the hospital the sawmill will supply approximately 200 tonnes (600 cubic metres) of wood chips per annum. 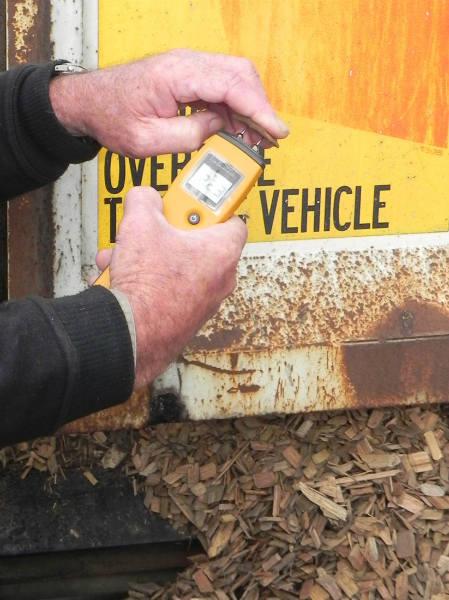 In doing so it has agreed to meet specific wood chip quality criteria to ensure they are clean, have a moisture content below 30% and ideally around 20% and are stored separately undercover. In doing this Pyrenees Timber is investigating using some of its chips for its own drying kiln which is currently fuelled by brown coal briquettes. So the arrangement with the hospital has become a catalyst for value-adding to wood chips enabling the business to increase revenue and reduce its heating expenditure. Using second hand components where possible the mill has been able to develop the necessary wood chip processing infrastructure for around $53,000. Annual revenue to the mill for supplying the chips to the hospital is $21,600 and if the mill converts to chips for its own kiln drying there is a potential fuel saving cost of $22,000 per year. At Pyrenees Timber the contract to supply wood chips to the hospital boiler has involved some capital outlay (minimised by innovation with existing machinery) but has added value to a low value by-product and if briquettes are replaced with wood chips for drying timber annual energy cost will be reduced. The next facility in the region considering a biofuel boiler is the Horsham Aquatic Centre. Scherger says it could be fuelled using 480 tonnes of timber and green waste diverted from landfill and reduce the Centre’s annual heating cost by $25,000. Pécs is a beautiful city in the Southwest of Hungary with almost 160,000 inhabitants and a large district heating grid. In the past the heat was delivered using coal and natural gas. Today Pécs sees itself as the first green city in Hungary. Starting 2013 the city’s heat generation has been based completely on biomass. The biomass is sourced from a circle of 100km around the city. The feedstock: wood of low quality, by-products of the wood industry, straw, corn stalk, sunflower shells. Only 3% of the produced straw in this area is collected as biomass for energy. The existing coal fired power station was adapted to this new feedstock. In two boilers with a capacity of nearly 300 MWth about 400,000 tons of woody biomass and 180,000 tons herbaceous biomass (straw, cornstalks) are combusted to generate heat and electricity. The CHP (combined heat and power) unit using woody biomass started in 2004, and the straw-fired plant in 2013. The first idea for the project was born in 2002. The development of a new supply chain for straw was one on the biggest challenges. The DALKIA group owns and operates the plant. The new straw fired combined heat and electricity plant reduces the CO2 emissions by 150,000 tons CO2 compared to the use of natural gas. The import of gas can now be reduced by 80 million cubic metres, and 170 new local jobs were created. Including by the wood boiler replacing coal – CO2 savings reach 0.5 million tons. Australia lags behind all other comparable countries in development of its potentially most significant and cost-competitive renewable – bioenergy. In 2001, at the start of the Howard government Renewable Energy Target, bioenergy was touted as being the renewable most likely to provide the greatest contribution to renewable electricity production, as well as of industrial heat and transport fuels. A group of six people from the south east of Australia (four from Victoria and one from Tasmania) attended the World Bioenergy conference in the Swedish city of Jönköping. Bioenergy is big in Sweden and provides a larger share of final energy (over 34%) than comes from any other source, including from nuclear, hydro or oil. The Swedes say their target of getting 39% of final energy from biomass by 2020 will be exceeded, along with their target of 49% overall of final energy from renewables. 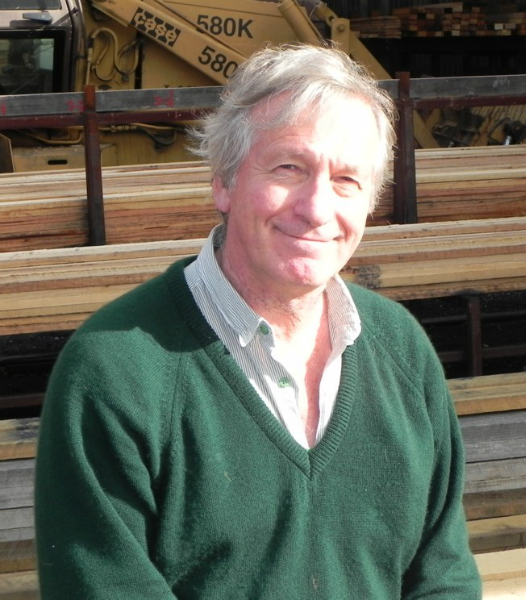 Andrew Lang contends the spin-off for rural Australia and the environment will be most profound when bioenergy is properly incorporated into the energy system. In Sweden the other renewables are principally of hydro (providing about 10% of final energy and 45% of electricity), with wind making up on a very minor contribution of 1% of final energy and 2% of electricity. The Swedes have another target – to cease to import fossil fuels including for transport by 2030, and to replace all fossil transport fuels with biofuels. Their progress in this is really obvious. 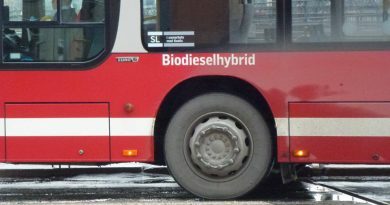 All the buses into Stockholm from Arlanda airport ran on biodiesel, and all the city buses ran on one or other of upgraded biogas, ethanol or biodiesel. Swedavia, the corporation that manages Sweden’s ten main airports, has a ruling that all taxis serving these must be hybrids or run on biofuels. Since airport business makes up a lot of taxi income the result is that most taxis now run on what the Swede’s call ‘safe fuels’, meaning that they are able to run on 85% ethanol, upgraded biogas or biodiesel. In fact this is now a feature of up to 90% of new cars sold in Sweden. A carbon dioxide tax imposed since 1991 is the main driver of all this change. As well as stimulating the change toward renewable energy it has also meant that air and water quality has measurably improved since the old days of reliance on oil and coal for heating and electricity. For instance, in the conference city of Jönköping the 19 oil-fired heating plants supplying the district heating system have been replaced by one super-low-emission waste to energy plant. This use of biomass and waste to generate heat and electricity is the case in all cities across Sweden. Outside the cities heating is either by a small district heat system or by highly efficient, smokeless wood chip or pellet fuelled heaters. The Australian group now comes back with information on all this. Between them they witnessed bioenergy technologies that we could have here, whether it is biodiesel on farms, producing pure methane from cow manure, or more efficient harvesting and handling of plantation thinnings. 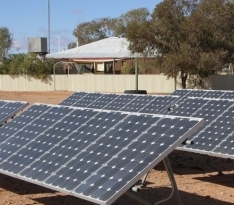 The spin-off for rural Australia will be most profound when bioenergy is properly incorporated into the energy system. Some real possibilities, that are currently seen in Sweden and other EU countries, are that farmers will get paid more for straw, plantation forestry managers will have another market for thinnings and harvest residues, and intensive animal producers and food manufacturing industry will be able to turn the putrescibles wastes they generate into a source of heat and electricity. Regional municipalities will be able to utilise wastes and residues generated within their boundaries to produce heat, electricity and transport fuels that are presently bought in, and thus keep this ‘energy money’ within the local economy. The overriding reasons why many countries have developed bioenergy are the same ones that should apply here: it utilises wastes and residues that otherwise generate greenhouse gases, it generates significant permanent employment particularly in rural areas, it is baseload, highly scaleable and cost-competitive with not just other renewables but also fossil fuelled energy options, and it is associated with positive carbon sequestration. I am building a large house on some land I have in Bungaree Vic. I am wanting to install hydronic heating but as we have no natural gas and are on a timber floor, the options I have are reduced. The reason I am contacting you is I have been starting to research alternative cost efficient types of biomass fired boilers and I stumbled across this page. 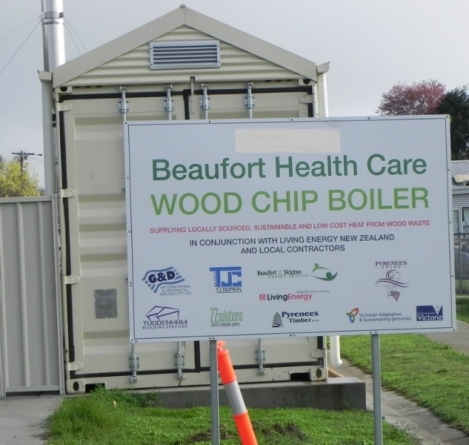 I see that the Beaufort hospital has just started using a woodchip fired boilers to heat the hospital and it appears to be a good thing. Beaufort is about 45mins west of where we will be building. I would love to be able to speak to someone about this type of heating to use in a large residential house to gather as much info as I can. Are you able to help me at all?